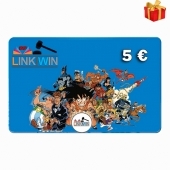 This product cannot be bought from the loyalty point of our website .When you buy this virtual card 5€, you can put in the search facility, BD, screen printing, etc. that you would like to purchase.You will also receive a SMS package to inform you when you are outbid on a product that interests you. This product cannot be bought from the loyalty point of our website .With the purchase of this virtual card with 10 € you can put in the search facility, BD, screen printing, etc. that you would like to purchase.You will also receive a SMS package to inform you when you are outbid on a product that interests you.